Taking on the students will cost the Oakland Unified School District as much as several hundred-thousand dollars. 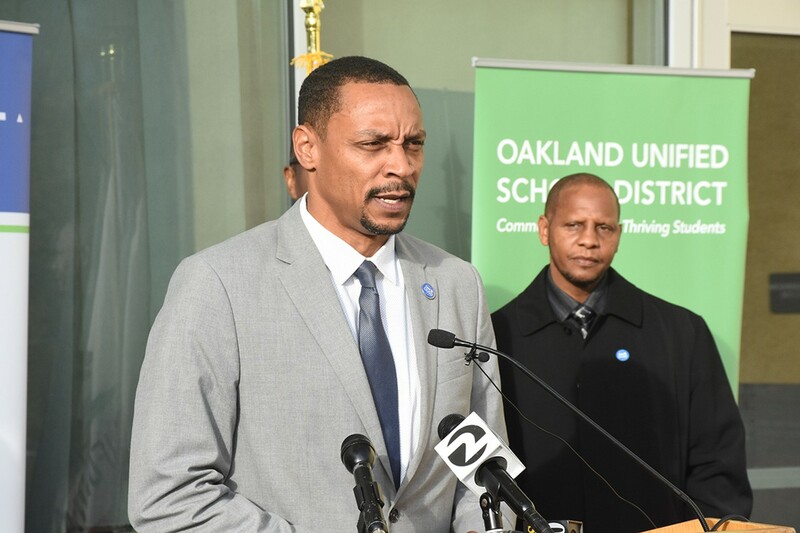 OUSD board President James Harris was on the board of the two charter schools. When nonprofit Youth Uprising opened two new Oakland charter schools in 2015, they were hailed as anchors of a "cradle-to-college" education pipeline serving families in a troubled deep east neighborhood. Private donors, and even the the state of California, showered the schools with grant money. Parents and community leaders praised the charters. But both schools failed to enroll enough students and quickly ran out of money. One, Castlemont Junior Academy, was shut down entirely in 2016. The other, Castlemont Primary Academy, is currently being merged into a district-run public school. Now, according to Oakland Unified School District officials, taking on the students will cost the district as much as several hundred-thousand dollars. And the operator of both charters, the Castlemont Community Transformation Schools organization, still owes the district at least $22,101 in unpaid rent — at the same time OUSD is facing a $14 million budget shortfall. Backers of the folded schools say their rocky road illustrates how difficult it is to serve primarily Black youth using the charter model. Others say the episode is emblematic of a district that has allowed charters to expand too fast, and that there's not enough oversight and accountability. "These were resources that would have been in OUSD, but now they're gone," said school board director Shanthi Gonzales. "Students' educations are being disrupted as a result." Roseann Torres, another OUSD board director, said she had not even been briefed about the failed schools. She told the Express that there needs to be much more stringent oversight of charters. The Castlemont Community Transformation Schools obtained two charters from OUSD in August and November 2014 to operate a kindergarten, elementary, and junior-high school. But support wasn't unanimous; school board director Jody London voted against both charters, and Torres voted against Primary Academy. "My decision was based less on the merits of that particular proposal and more on the fact that we have too many charters," London explained. She added that the Castlemont Primary Academy was going to directly compete with the district's nearby Parker Elementary School, which was performing well, and she didn't want to undermine it by signing off on a charter that would draw resources away. Nevertheless, in May 2015, the school board approved a lease allowing CCTS to rent classrooms at the Castlemont High School campus for $88,407 a year. The Primary Academy, which opened in August 2015, also benefitted from a Walton Family Foundation grant. And in November 2015, the state Department of Education gave the Junior Academy $375,000 in startup money. But right away, budgets dipped into the red. Olis Simmons, the CEO of Youth Uprising and a CCTS board member, said the goal was bigger than just a school; it was about launching "a network of supports and resources for an intergenerational disenfranchised community." Most charters in the Bay Area skim off the best performing students with the fewest special needs, said Simmons, leaving the most difficult-to-educate kids in public schools. In contrast, she said many of the CCTS students were dealing with trauma sustained from poverty, sexual abuse, and homelessness, which requires extra resources. The CCTS student populations at the primary and junior academies were 85 percent Black, many from very-low income households, according to Hae-Sin Thomas, the CEO of Education for Change, another charter-school operator who was also on the CCTS board. Some parents who sent their kids to the Primary Academy praised the school. "It helped my child transition very well from one point to the next," said Cassandra Hughes, whose daughter attended the kindergarten program. "It's a horrible thing they're closing." But many parents who signed the charter school's petitions in 2014 didn't end up enrolling their children, and the schools' administrators made significant errors predicting attendance. For example, the Primary Academy was supposed to have 60 first graders enrolled in the fall of its first year, but only 22 ultimately registered, according to school records. "It looked like we had good numbers. We were methodical. But on the ground, we couldn't realize that enrollment," Simmons admitted. By November 2015, the CCTS schools were facing an operating deficit of $150,000, and the Walton Family Foundation was pressing the organization's leaders on their plans to fill this hole. The $375,000 state grant provided some respite. But by February 2016, the school's enrollment had decreased by another sixteen students. That same month, OUSD board President James Harris joined the CCTS board, as did Yana Smith, an OUSD employee with the title "chief of organizational effectiveness and culture." Harris, who was re-elected to the school board this past November with help from hundreds of thousands of dollars in independent expenditures by pro-charter groups, didn't respond to an email seeking comment. Smith no longer works at OUSD. Simmons said CCTS was "very intentional" about adding Harris and Smith. "There was no benefit to us from having people from the district on the board," said Simmons. "We believe in public-private partnerships." The last half of the 2015-16 school year was rough for the two schools. By March, the Junior Academy had closed. Its students were transferred to nearby schools, according to records. In order to pay its bills, the organization briefly explored a proposal to obtain money from private Oregon-based company Charter School Capital, which uses a technique called a "receivable sales option" to buy a school's expected future revenue at a discount. According to the Portland Business Journal, Charter School Capital has lent $1 billion to charter schools throughout the U.S., and "President-elect Donald Trump's selection of Betsy DeVos for education secretary could be a boon," for the company because she supports privatization of school finances. CCTS board members didn't respond to questions about whether they sold options to Charter School Capital. In June, the Oakland-based nonprofit Educate 78 provided a $78,000 grant to the Primary Academy, but the next month the school still was facing a massive $672,000 deficit. According to board minutes from November 4, 2016, the defunct Junior Academy was also approximately $200,000 in debt to unspecified creditors. Now, the charter schools' financial problems threaten to burden OUSD. In an emailed statement, OUSD spokesman John Sasaki confirmed that CCTS is currently behind on rent payments. "There are 4 billings in equal payment ($22,101.75) per the lease agreement," explained Sasaki. "They made the first payment so far and are behind in making the second payment." The lease agreement between OUSD and CCTS was originally for five years. OUSD was looking forward to collecting a total of $442,035 in rent over the period. Simmons and Thomas confirmed that CCTS owes $22,101 in rent to OUSD, but they said "the district" approached them last year and offered a deal: If CCTS would move out of their facilities at Castlemont, OUSD would forgive the remaining two rent payments in the 2016-17 school year, totaling $44,203. This deal, however, was never brought to OUSD's board, even though the original lease agreement was a contract that required a board approval. Then according to a letter sent to parents by LaShawn Routé Chatmon, the board chair of CCTS, it was decided that the Primary Academy's 85 students would begin attending Parker Elementary effective February 6 — a merger of the failed charter school into the district school. But the OUSD board was never informed about this merger. School-board directors Gonzales and Torres questioned why they were kept out of the loop. "Parker [Elementary] is in my district," Gonzales said. "All I got a letter that said it'll be a seamless transition to merge the schools." But Simmons and Thomas said OUSD's board doesn't need to oversee these matters, and pointed out that Harris was aware of the agreements from the beginning. Thomas also said the CCTS schools voluntarily surrendered their charters, which under state law requires no notification to the district's board. One reason why the OUSD board should have been notified, according to several directors, is the large cost the merger will incur to the district. Gonzales estimated that it is likely to set OUSD back more than $300,000, because it will cost an extra $3,925 to take on each new student at Parker Elementary through the end of the year. Simmons and Thomas disagree. They claim the short-term cost is actually about $100,000, and that Parker Elementary will also get four full-time, and one half-time, CCTS staffers, who are already grant-funded. They claim the ultimate cost to the district will net out to zero. Whatever the costs, Simmons said that she wants the public to know that the CCTS schools "didn't fail." "We took a risk and did amazing things," she said, "but couldn't get the numbers to work." Gonzales said the issue isn't about the risk, but rather the costs — and the fact that school-board members are asked to constantly approve new charters, but then are kept in the dark when they fail. "They were supposed to be able to run that school all year with the money they got from the state," Gonzales said. "What happened to all that money? The public has a right to know."